I made the “halfway down” reference to mean stopping at the upper deck, since this stairway continued into the lower deck. 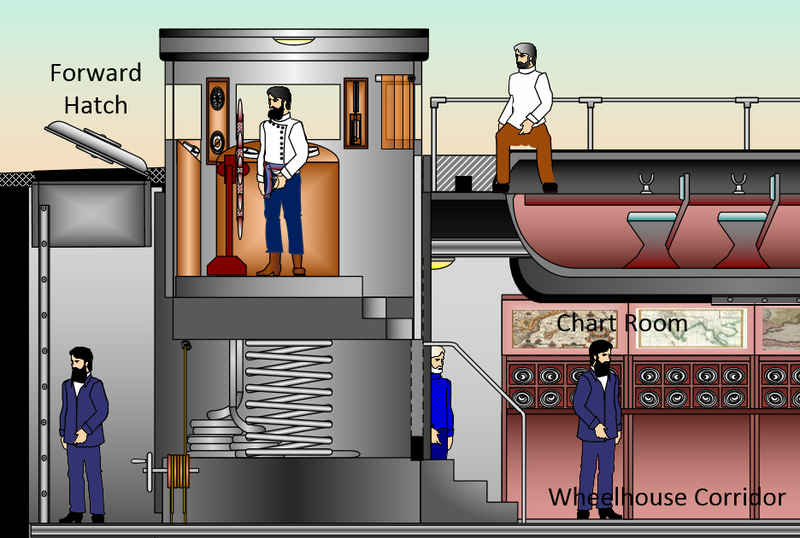 At the forward end of the short corridor, past the Chart Room, I placed the access to the Wheelhouse with a short set of steps for entry when the Wheelhouse is in its lowered position. I also placed that Chart Room in this ‘short corridor’ for convenience to the Captain, First Officer, Helmsman or whoever might need these resources. 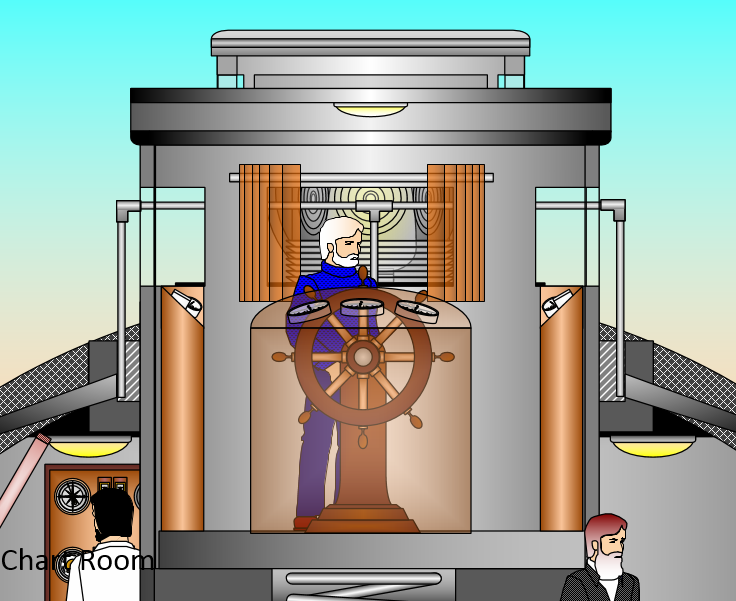 Although stated this way, I did not apply the lenticular panels to the Wheelhouse windows. They work very nicely magnifying lighthouse lamps, and I did use them myself in the aft “reflector”, but the pilot or helmsman needs clear glass to see through. A major discrepancy, for me, between reality and the narration is with the withdrawal into the superstructure, the Wheelhouse and Searchlight, for combat. Aronnax describes members of the crew withdrawing the deck structures; Wheelhouse, Reflector and Railing, “pushing them down” into the hull to make it clean and smooth for ramming attacks. I attempted to apply a “periscope” principal to the Wheel House retraction, allowing space for gathering cables between the unit and the upper deck surface. This could imply the retraction is manually effected by hand cranking. (The text refers to “pushing” the Wheelhouse down. I believe both objects to be too massive for that.) But pushing may be a standard assist to the mechanical method. Setting the Wheelhouse on a spring and hauling it down with block & tackle would be simple, add little weight, and be helped by a little ‘pushing’ from above. A very ‘1869’ and simplistic Nemo method. 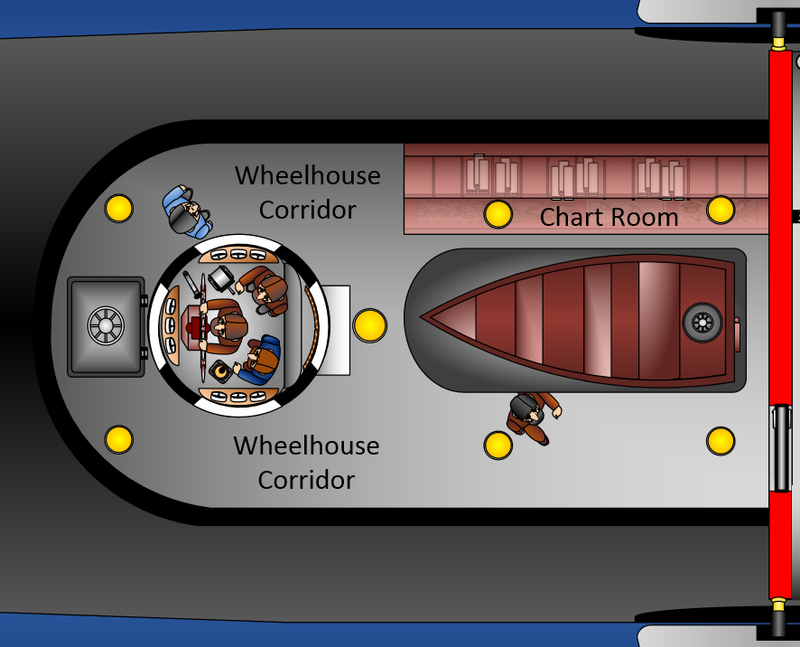 Also, the text and original art depict the Wheelhouse being raised while traveling below the surface. 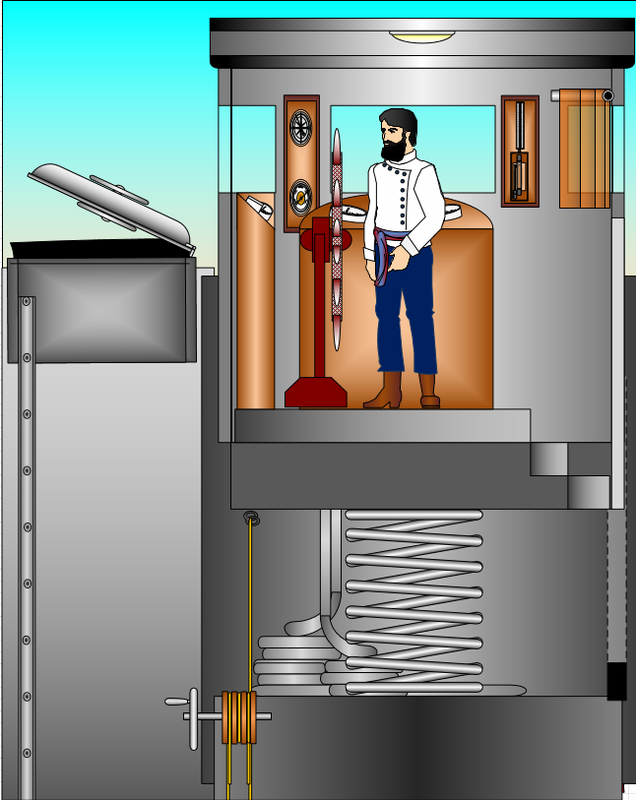 If the Wheelhouse was a true cylinder, sealing the hull from the sea water would be much simpler. Water would also slip around the circular shape easier than any other, for both the Wheelhouse and the Reflector/Searchlight. 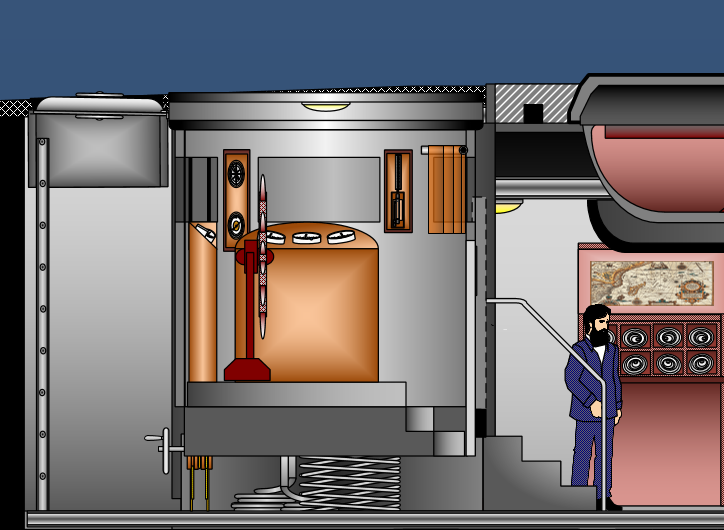 “The helmsman is stationed in a cage raised above the hull and equipped with glass window(s).” Note that simple glass is mentioned, not the lenticular glass I believe was used for the Searchlight itself. 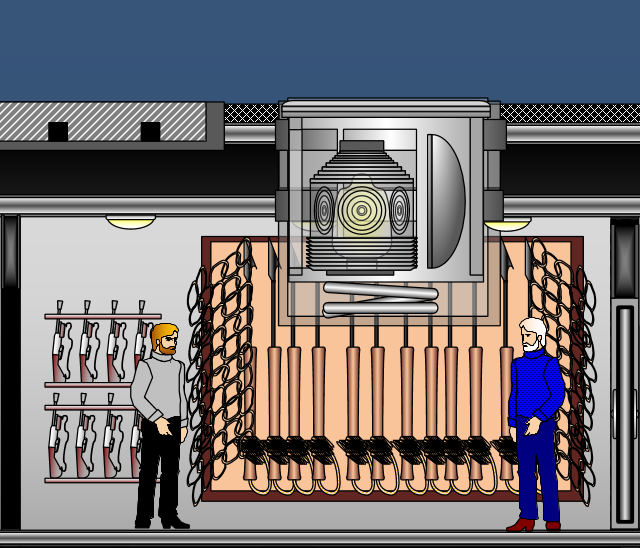 A curtain or panel could easily be applied to the rear window in the Wheelhouse to block that very powerful, and extremely bright, Searchlight when traveling at night on the surface, or when the Wheelhouse is extended while submerged. 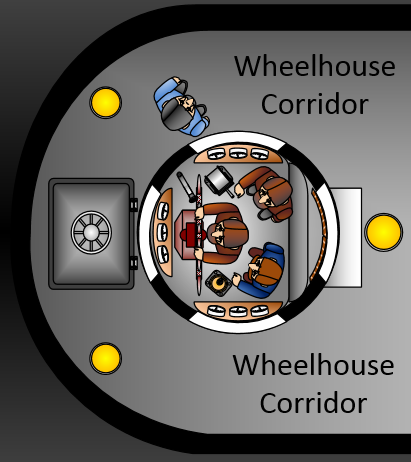 Ch 29: The Wheelhouse was described in the text to have, on at least one occasion, three people in it. The original text measurement of 6′ square would not be sufficient. 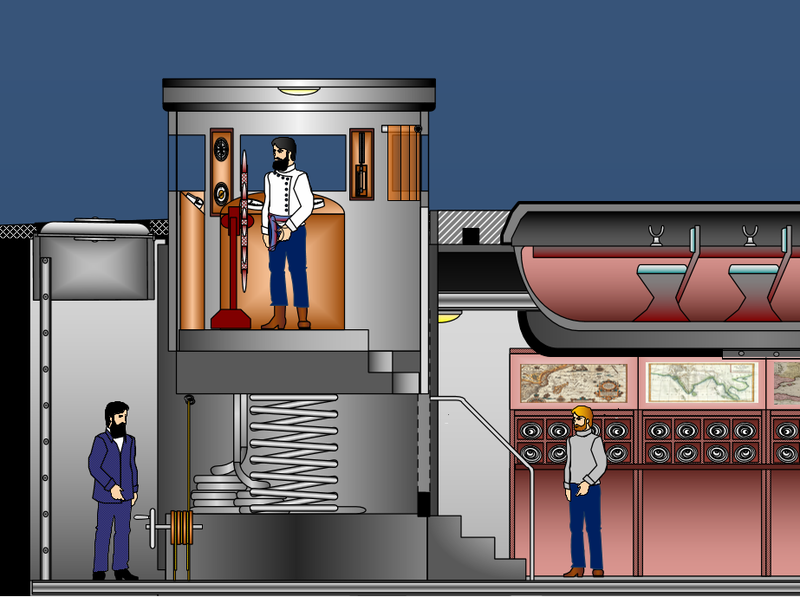 I made mine large enough for Nemo, Aronnax and the helmsman, along with the large wheel and other mechanics. Again, my final decision on lowering and raising the Wheelhouse & Searchlight is; this must be done to render the hull completely smooth for ramming or escaping from ice. The two directional fins (Diving Planes in modern sub terms) on the sides of the boat were “worked by powerful levers.” and were “turned up to a vertical position” in the Sargasso Sea. For me, this allows for a possible recess in the hull to accept the fins, when raised. Again, for insuring the hull is completely smooth for ramming, a Nemo Passion.